The origins of "I Was Born About Ten Thousand Years Ago" can be traced back to 1894, when H.C. Verner and Harry C. Clyde wrote "I Am A Highly Educated Man," a bragging song that combined biblical and historical comedy. 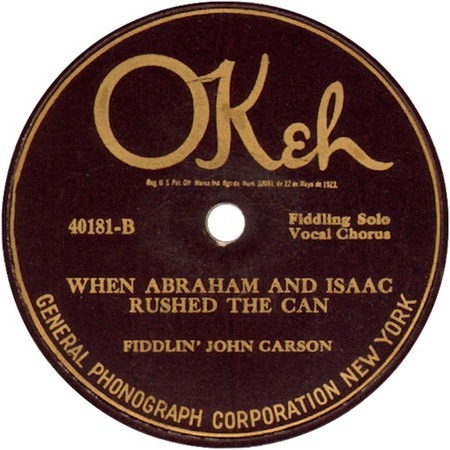 Variatiions on the theme abounded, with such titles as "The Bragging Song," "The Liar," "I'm The Man That Rode The Mule Around The World," "The Historian," "The Highly Educated Man" and, as is the case with Fiddlin' John Carson's recording, "When Abraham And Isaac Rushed The Can" (though this is also reported as "When Abraham And Isaac Rushed Out"). However, most titles tend to be a variation of "I was born(ed) (about) four thousand (10,000/ 4,000) years ago." Carson made the original recording in late March or early April 1924 (exact date unknown) and it was released on OKeh 40181 as the B-side of "Old And In The Way." RCA first released Elvis's recording as a series of linking excerpts on the wonderful "Elvis Country" LP—almost a concept album.